What is PCB and PCBA? PCB also was known as a Printed circuit board and a Printed circuit board, is commonly used in the English abbreviation PCB (Printed circuit board).Because it is produced by electronic printing technology, it is called "printed" circuit board. Before printed circuit boards, the interconnection of electronic components depended on the direct connection of wires to form a complete circuit. PCBA is the abbreviation of Printed Circuit Board +Assembly in English, which means that the PCB blank board passes through the SMT upper part, and then passes through the whole process of DIP plug-in, referred to as PCBA. This is a commonly used method in China. The design of the printed circuit board is based on the electronic circuit diagram, which realizes the functions required by the circuit user. Printed circuit board design mainly refers to the layout design, which requires internal electronic components, metal wiring, through-hole and external connection layout, electromagnetic protection, heat dissipation, crosstalk and other factors. Excellent circuit design can save production costs and achieve good circuit performance and heat dissipation. Simple layout design can be achieved by hand, but complex circuit design generally needs to be realized by computer aided design (CAD), and famous design software includes Protel, OrCAD, PowerPCB, FreePCB, etc. 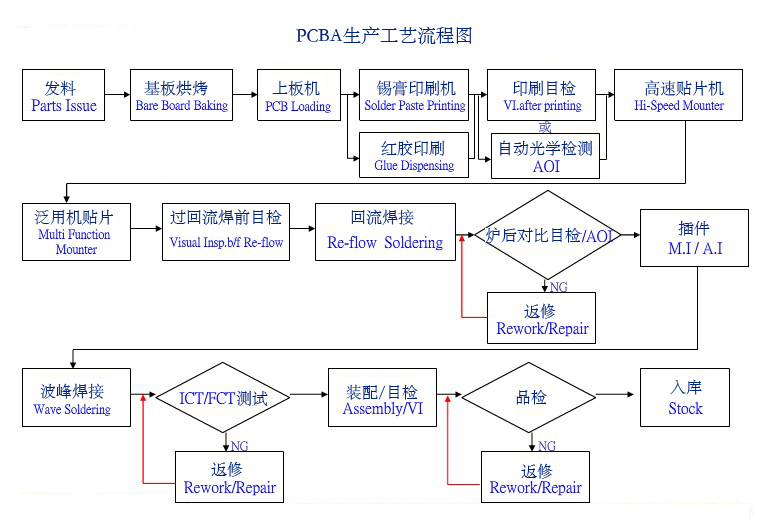 In short, the PCBA process is a combination of SMT processing and DIP processing. According to the requirements of different production technologies, it can be divided into single-sided SMT placement process, single-sided DIP insertion process, single-sided mixing process, single-sided stickers. Packing and inserting mixing process, double-sided SMT placement process and double-sided mixing process, etc. Both SMT and DIP are ways to integrate parts on the PCB. The main difference is that SMT does not need to drill holes in the PCB. In DIP, the PIN pin of the part needs to be inserted into the hole that has been drilled. Surface mount technology mainly uses the placement machine to mount some micro-miniature parts onto the PCB. The production process is: PCB board positioning, printing solder paste, placement machine placement, over-reflow oven and inspection. With the development of technology, SMT can also mount some large-sized parts, for example, some large-sized mechanical parts can be mounted on the motherboard. SMT integration is sensitive to positioning and part size, and solder paste quality and print quality also play a key role. DIP is a "plug-in", that is, inserting parts on the PCB version. Because the part size is large and it is not suitable for placement or the manufacturer's production process cannot use SMT technology, the parts are integrated in the form of plug-ins. At present, there are two implementations of manual plug-ins and robot plug-ins in the industry. The main production processes are: adhesive backing (to prevent tin plating from being undone), plug-in, inspection, wave soldering, brushing (removing in the furnace) The stains left in the process) and finished inspection. After the solder paste is taken out of the refrigerator and thawed, it is stirred by hand or machine to suit printing and soldering. The solder paste is placed on the steel mesh, and the solder paste is printed on the PCB pad by a doctor blade. SPI is a solder paste thickness detector that can detect the solder paste printing and control the solder paste printing effect. The chip components are placed on the Feida, and the chip head is accurately placed on the PCB pad by identifying the components on the feeder. The mounted PCB board is reflowed, and the paste-like solder paste is heated to a liquid after passing through the high temperature inside, and finally cooled and solidified to complete the soldering. AOI is an automatic optical inspection, which can detect the welding effect of the PCB by scanning, and can detect the defects of the board. Repair the AOI or manually detected defects. Insert the plug material into the pins and insert them on the PCB board. The inserted board is soldered by wave soldering. In this process, liquid tin is sprayed onto the PCB board, and finally cooled to complete the soldering. The pins of the soldered board are too long to be cut. Manual soldering of components using an electric soldering iron. Inspection of the PCB board, unqualified products need to be repaired, qualified products can enter the next process. PCBA testing can be divided into ICT testing, FCT testing, aging testing, vibration testing, etc. PCBA testing is a big test. The testing methods used are different according to different products and different customer requirements. The ICT test detects the welding condition of components and the on-off condition of the line, while the FCT test detects the input and output parameters of the PCBA board to see if it meets the requirements. The PCBA board that has been tested without problems will be assembled for the housing, then tested, and finally shipped. 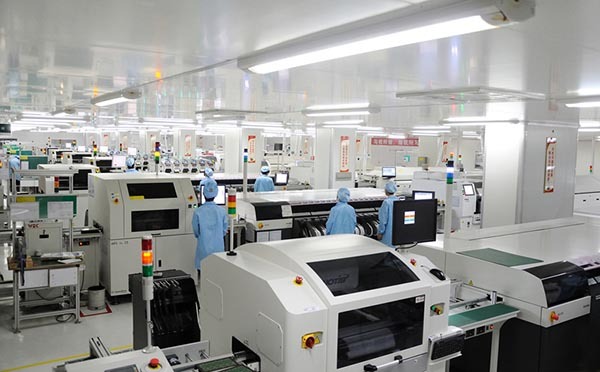 PCBA production is a loop of a ring, and any problem in one link will have a very large impact on the overall quality, and strict control of each process is required. First, the "castle" shape leadless device welding process requirements. Second, the surface array pin device soldering process. » How is a PCB board made? 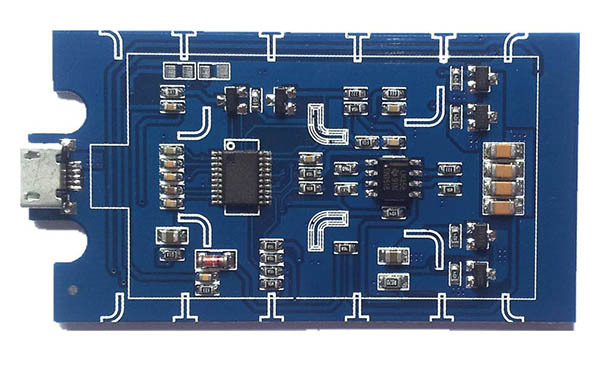 » What is the differrence between PCB and PCBA? » What Is Copper Plating In PCB?